The warmer weather of summertime calls for fresh, bright dishes. Moving away from winter’s comfort food, we long to stay hydrated, to feel energised though lighter eating..
It’s not uncommon to see fruit in salads, particularly peaches and nectarines. Firstly, an hors d’oeuvre of seared scallops on watermelon alerted me to how great watermelon tasted in combination with the richness of seafood. The opposition of textures and flavours was a revelation. This is a great recipe to spread a dozen prawns go further around a group. You could use octopus instead of the prawns. If you’re really stuck for time, use Chang’s Fried Noodle Salad Dressing instead of making your own, with the addition of lime juice to balance and lighten the mix. Serve as either a side or main course. Roast pine nuts in pan until golden. Set aside. Combine dressing ingredients in a jar. Taste for balance, then set aside. 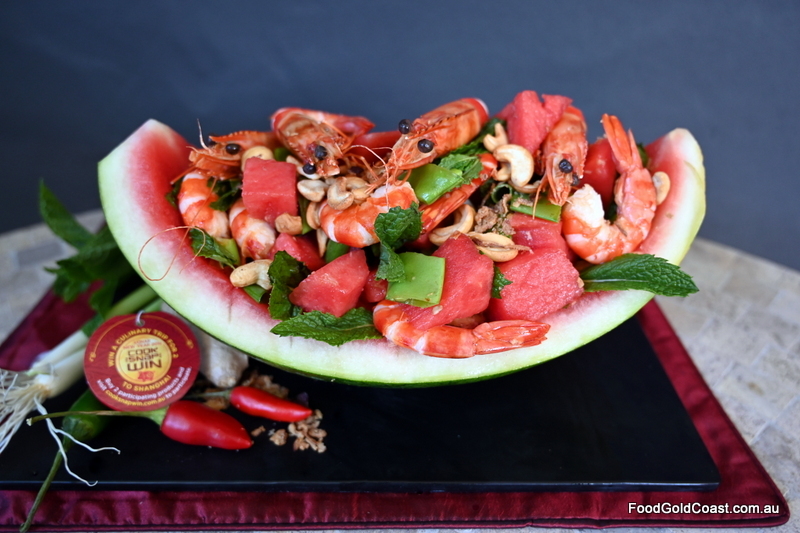 Place watermelon in a large bowl with fried shallots, snow peas and mint leaves. Shake sauce then dress salad and lightly mix. Scatter with pine nuts and fried onion flakes. Decorate with extra prawns (optional) and serve immediately.